I was pleasantly surprised to see the BBC and several technology web sites pick up on this week’s 50th anniversary of the introduction of IBM’s System/360 family of medium and large scale computers. The System/360 doesn’t often receive the attention it deserves but it really was a game changer for the industry, as it was the first range of computers to address the issue of software compatibility between different classes of machine, allowing code developed for one System/360 model to run on any other model in the family. This was achieved through a technique known as microprogramming which was conceived by British computer scientist Maurice Wilkes at Cambridge University in 1951. Before System/360, organisations looking to upgrade their computer system would have to rewrite their software to run on the new hardware, unless there happened to be an emulator available for the new model which could automatically translate and run code written for the old machine. However, emulators were difficult to come by in the 1960s and many organisations remained locked in to ageing or inadequate systems as they could not afford the time or investment required to rewrite their software. System/360 changed all this by allowing organisations whose needs had outgrown a particular class of machine to migrate to a larger model without having to worry about software compatibility. The development of the System/360 range was one of the largest projects ever undertaken by IBM (or any computer company for that matter). Development costs were estimated at a whopping $5 billion, equivalent to over $37 billion today. The development of the operating system was so problematic that it inspired the manager responsible, Fred Brooks, to write his seminal book on software project management, The Mythical Man-Month: Essays in Software Engineering, which was first published in 1975. Also, as the new family would replace IBM’s entire data processor product range and its development would necessitate a halt to all existing product development projects, including mid-life upgrades to existing models, it put the company in a highly vulnerable position until the new line came on stream. One IBM executive summed it up perfectly by telling Fortune magazine, “We call this project ‘you bet your company’”. Fortunately for IBM, the System/360 range was a huge success and the System/360 architecture would form the basis of the company’s data processor products for the next two decades. 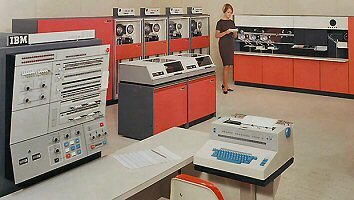 In the 1960s where IBM led, the rest of the computer industry followed and other firms soon began offering their own families of compatible machines. Some of these companies, such as RCA and Sperry Rand, went even further by also making their machines software compatible with System/360. The impact of System/360 on the computer industry was immense, rivaled only by the IBM PC and Apple Macintosh in the 1980s. It’s good to see this finally reflected in the media attention System/360 is now receiving as a result of its 50th anniversary. This entry was posted in Uncategorized and tagged IBM, microprogramming, System/360 on 08/04/2014 by Stephen J Marshall.